SIMATIC TDC solves even complex drive, control and technology tasks with maximum quantity frameworks and shortest cycle times on one single platform. The system is used particularly for large plants in the process, energy and drive technology. Metal production and metal processing: Wire-drawing plants, stretcher levelers, bending and straightening machines, presses, circular arc type plants, rolling mills, upsetting devices, shearing and winding machines and High Voltage Direct Current Transmission Systems (HVDC).The last one is Flexible AC Transmission Systems (FACTS), e.g. Reactive Power Compensation solutions. 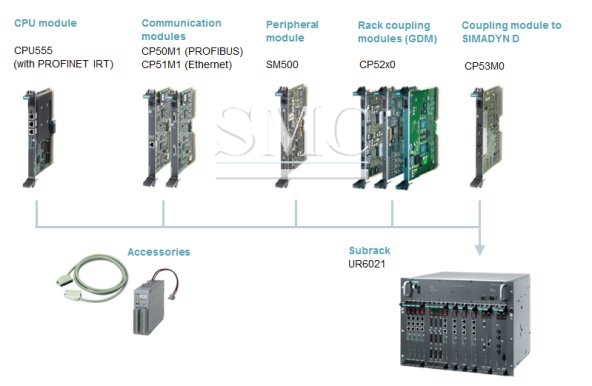 SIMATIC TDC is a modular multi-processor system which consists of one or several subracks. The subracks (VMEbus standard) are equipped with processor, periphery and communication modules. For the connection to further automation components SIMATIC TDC supports the communication standards are PROFINET/ PROFIBUS / Industrial Ethernet. Within the SIMATIC S7-400, the enhanced application module FM 458-1 DP is setting new standards. This intelligent module combines powerful arithmetic operations ability, high processing speed, precision and flexibility. These are the features required to solve a wide range of processing tasks universally even with extremely high throughput rates. Communication takes place over the PROFIBUS DP interface on the FM 458-1 DP. This offers the following characteristics such as constant bus cycle time, i.e. the PROFIBUS DP cycle is always precisely the same length.Then goes isochronous, i.e. the CPU, I/O and user program which are synchronized with the PROFIBUS cycle.Two others are slave-to-slave communication, i.e. the configured slaves can exchange data with each other directly without the need for any additional configuring work on the FM 458-1 DP and routing capability, i.e. all nodes are accessed over one interface, e.g. MPI (Multi-Point Interface) or PROFIBUS DP and optionally also Industrial Ethernet. The I/O expansion EXM 438-1 provides extremely fast, synchronizable Digital and analog inputs and outputs and Speed and absolute value encoder measurement. The EXM 448/EXM 448-1 communication expansions provide fast connection of drives including PROFIBUS DP, as master or slave (not isochronous/clock-synchronized)and SIMOLINK, the fast, powerful, clock-synchronized fiber-optic cable (installed in EXM 448-1). Suitable for a wide range of different counting and measuring tasks with incremental or absolute value encoders up to a maximum of 2.5 MHz. 16 digital outputs as cam tracks (displacement or time cams). Each track can be individually adapted to the task with a delay or overrun. Dynamic delay, dynamic hysteresis. Controller structures/types are freely programmable, e.g. fixed value control, follow-on control, cascading control, ratio and mixer controls, continuous and override control, pressure, level and temperature control, hydraulic control, drive control. Open/closed-loop controlled positioning of up to 16 individual axes as well as multi-axis applications over PROFIBUS DP or SIMOLINK.